bows or leave the slit as is, you will wonder with always whole new look. 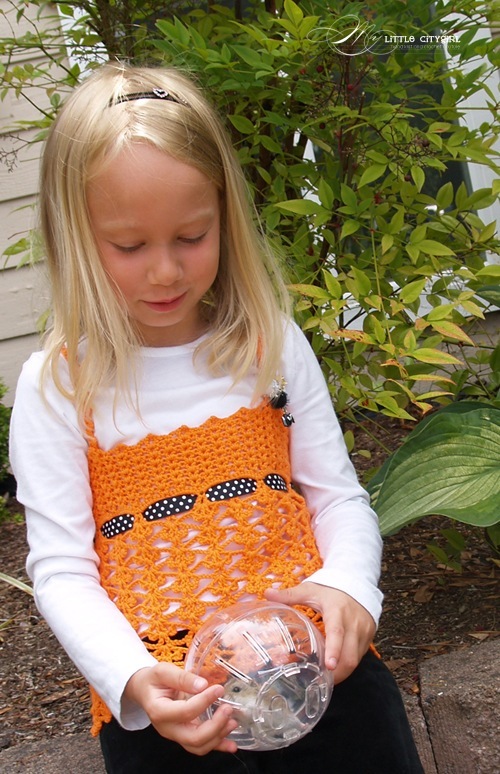 Perfect addition for her Fall wardrobe, Halloween and other occasion. And last, but not least… The eBook is available for download for FREE. 7 pages; 5 pics; a diagram; a schematic. Oh how nice Alla! 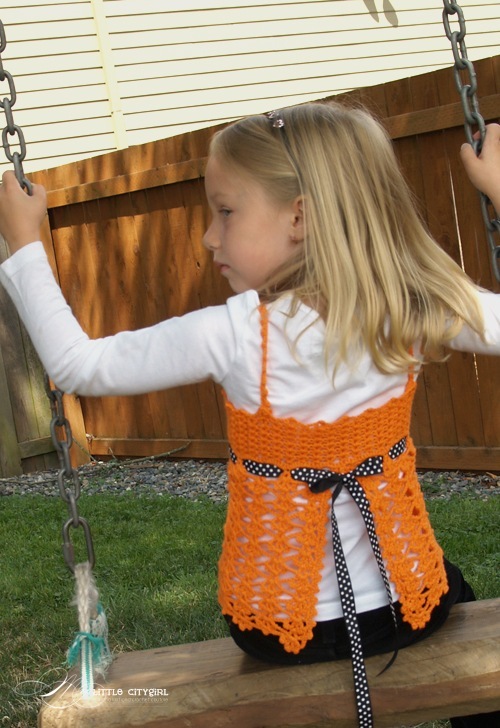 The top is very cute :) I can’t wait to start crocheting again. This move has definitely wore me down. I need a break eh? LOL!! I love the pictures too! Thanks so much. Can’t wait to get started on the patterns I purchase the other day as well as this one. Thanks sooooo much Alla, it is gorgeous!!! Another great pattern Alla, thanks so mucch! Thank you so much Ladies for stopping by and your Sweet comments! You are WELCOME! Denise! I’ve just started to work on patterns couple months ago and the patterns you see on eBay is practically all what I have so far. This site is only I have and will keep you all updated with all new patterns releases. Stay tuned ;) Thank you for your interest! This is so stinkin cute! Can’t wait to make for my daughter and nieces! I’ll let you know how it goes! Thanks for sharing! This tank is soooooooooo adorable! Im making it for my 5 year old daughter and possibly my neices for christmas. The only thing is (unless I have overlooked it) row 4 on the skirt has been left out. Im following the diagram so it is workable for me but there may be some first timers that cant figure it out. Just thought Id point that out. Thanks for the fabulous pattern!!!! First row says “(dc, picot, dc) in 7th ch from hook…”, where 6 chains before 7th ch from hook “including” turning ch 4 and suppose just skip 6 first chains and work (dc, picot, dc) in 7th ch from hook. This Tank Corset is so pretty! I can’t wait to try it out. Thank you for sharing this pattern with us! May GOD smile upon you today! 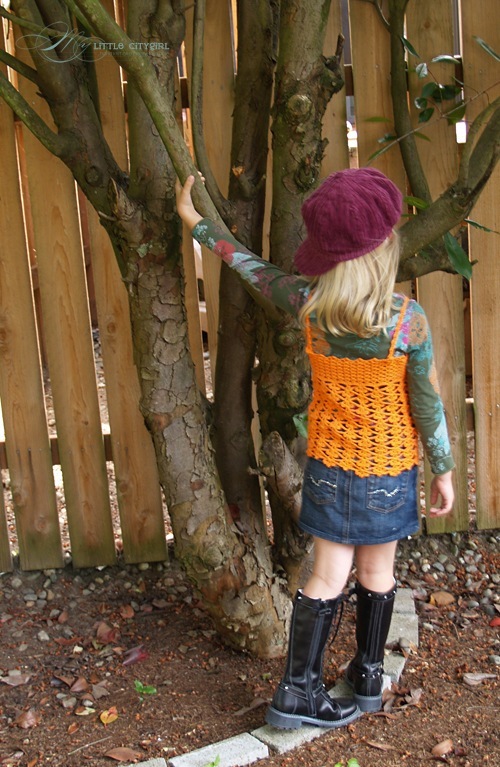 cute ones, love it…thanks for sharing this pattern!!! Heya Alla, Thank you for the free tank pattern.Its lovely. I have two little girls & a grand-daughter who would all love this. I found your pattern on ‘Favecrafts’, unfortunatly if you print the stitch guide, its too faint to use so you cant see the writing & the garment pattern doesnt print well either. This is an awful pity for people who aren’t familar with your wonderful site! Thank you so much for letting me know. I have no access to editing anything on Fivecrafts, but just emailed to editor of Fivecrafts and asked to fix it if possible. Thank you for sharing this pattern. I made the top for my granddaughters and added roses to dress it up. I used #30 red heart crochet thread. I made a hat to match from one of your patterns. The girls love their new camisole. Thanks for sharing. Would love to see more camisole patterns. Please advise if you have more patterns like this one. I found this pattern of yours, and I must say it looks very pretty. I am trying to make one for my daughter, but row 1 confuses me… I am not good at reading diagrams, so I am following written directions – whatever I get looks completely different from what I see on your picture. Are there supposed to be loops hanging underneath? Is it possible that you skipped *chain 4* somewhere in the instructions? I skip 7, dc, ch 1, dc, skip 7, (dc, picot, dc), ch 1, (dc, picot, dc) – the skipped 7 end up hanging below the row, and the pattern just doesn’t work out… Thanks so much and I look forward to your reply. Hiii,Thank you for sharing this pattern,can’t wait to try it out.Love it. I just finished making this for my church’s craft fair, which is tomorrow, and I used an orange “Happy Halloween” ribbon. I was so please with how it turned out. I’m going to make my two granddaughters each one now. They want ribbons for every holiday! Thank you for your beaufitul patterns! Здравствуйте Алла.Мне очень нравятса ваши работы.я живу в России и не знаю как купить шаблоны схемы ваших работ.хотела бы приобрести схемы пяти топов.сколько это будет стоить? so sweet of you to share this free tute, thank you sooo much for all the effords and the sharing. I love this pattern Alla! My daughter always wants to dress up like me when I wear my corset and this makes it not just possible, but easy. It is so cutee!! Thank you for sharing this pattern. I will make it for my daughter. WOW! Such a cute dress and perfect choice of color. I was so confused what to give to my niece for her first birthday. This is it! 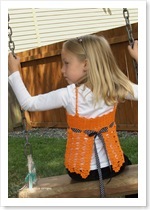 The little girl looks so cute in the elegant orange corset. I’ll make one in the same color, it’s just that it takes me so much time to complete a big project such as this one. I just get bored after a while and abandon it before even completing it.